Mushrooms are one of those ingredients that I often buy as an impulse purchase. They look good in the store and are on sale, so I grab them. But then I forget about them, and I often end up tossing them. Well, I was determined to use them this last time I purchased a pound. So after doing some looking around, I opted for this meal. 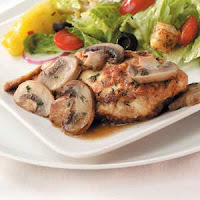 My recipe comes from this Taste of Home recipe for Chicken Marsala, but I couldn't call my version "Marsala" because I didn't use the wine. (I also skipped the marinating step.) So I opted for the boring name. Anyway, it's delicious. My husband loved it -- especially the mushrooms! If you want to go the "Marsala" route, just make sure you use MSPI-friendly substitutions. Flatten chicken to 1/2-inch thickness. Combine the flour, Italian seasoning, garlic powder, salt, paprika and pepper; sprinkle over both sides of chicken. In a large nonstick skillet coated with cooking spray, cook chicken in 1 tablespoon oil and margarine for 2 minutes on each side or until browned. Transfer to a 13-in. x 9-in. baking dish coated with cooking spray. Gradually add broth to skillet, stirring to loosen browned bits. Bring to a boil; cook and stir for 2 minutes. Strain sauce; set aside. In the same skillet, cook mushrooms in remaining oil for 2 minutes; drain. Stir sauce into mushrooms; heat through. Stir in parsley. Pour over chicken. Bake, uncovered, at 350° for 25-30 minutes or until chicken juices run clear. NOTE: If sauce isn't as thick as you would like. Mix together 1 tablespoon corn starch with 1-2 tablespoons water and add to the sauce after bringing it to a boil.